Gorgeous Setting With Fantastic Food! Lindfield is a beautiful little village on the outskirts of Haywards Heath in West Sussex. Rumour has it, it won Best Kept Village in Sussex so often residents were gently persuaded to withdraw to give others a fighting chance. 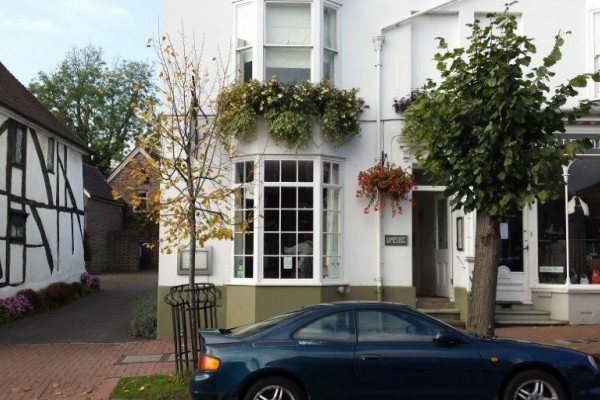 At its heart is an extremely picturesque high street lined with beautiful Linden trees and in prime position, amidst the independent shops and boutiques, you will find a lovely little forty seat restaurant called Limes. Recently acquired by husband and wife team Mike and Patcharee Morris, Limes has undergone a complete refurb and is now an exceptionally cosy place to while away an hour or two as you enjoy some of Patcharee’s fabulous cooking. The food is mainly traditional English but with the odd Thai twist reflecting Patcharee’s roots. 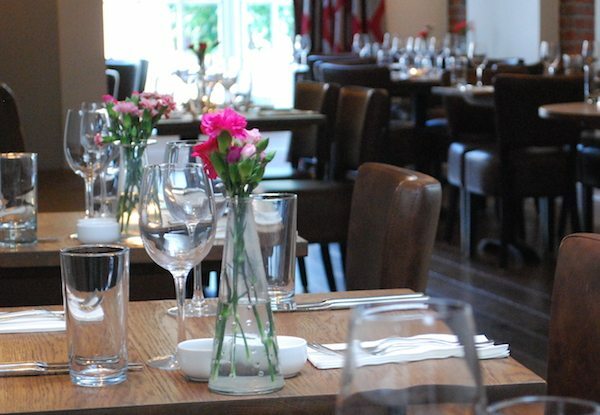 Patcharee and her team pride themselves on using seasonal, locally-sourced ingredients, so the menu changes regularly and absolutely everything (Bread, chutneys, cakes, ice-cream etc.) is made from scratch on the premises. 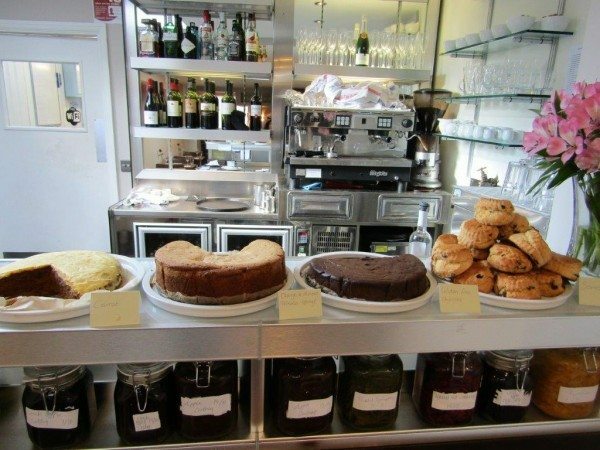 They offer a fantastic and varied menu, which should appeal to all tastes and serve breakfasts, lunches, afternoon teas and dinners. 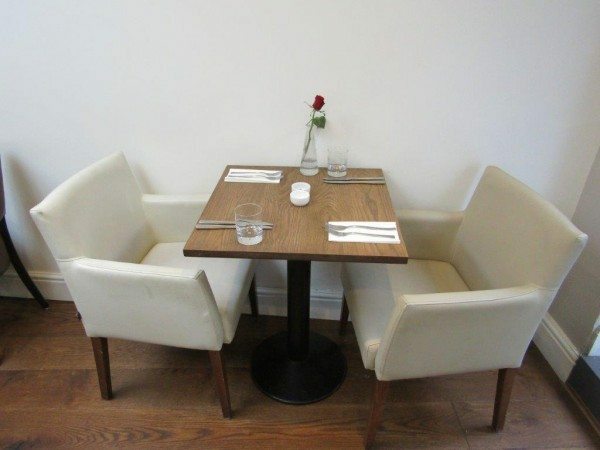 You can get children’s portions at £9.95 for two courses. They can cater for private functions and, if you want to spread the joy, you can buy someone who deserves a treat a Limes gift voucher. Once a month, on a Thursday evening, Patcharee showcases her culinary versatility and creativity by devising a tasting menu of eleven dishes inspired by her Thai heritage. 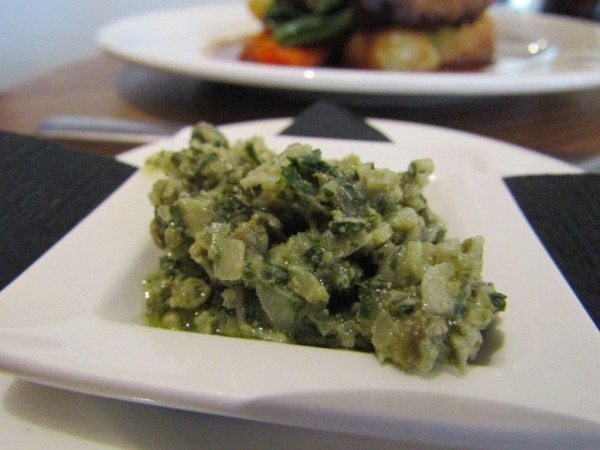 The dishes are gluten-free and vegan and are served with thoughtfully matched wine. Tickets cost £35 and must be booked in advance. 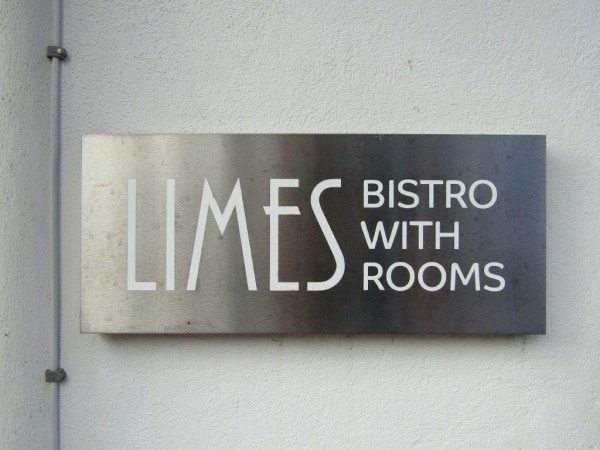 Not satisfied with just providing you with top notch grub, Limes also boasts two stylish modern apartments from which you can explore the historic town and even order room service during restaurant opening hours. There is parking along the main street and we were able to park right outside. 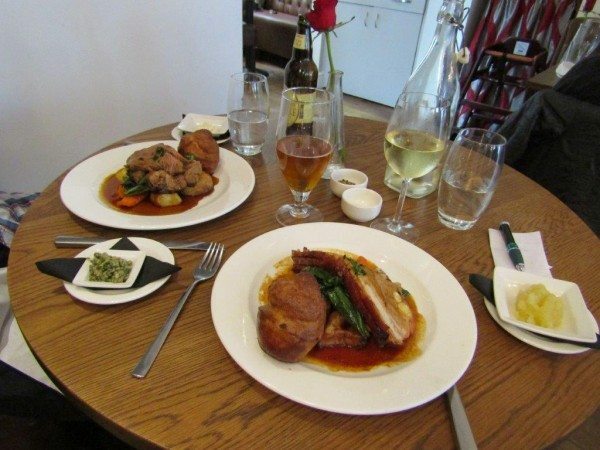 We were there to sample their Sunday roast and we couldn’t have chosen a better day for it. It was gloriously sunny, showing pretty Lindfield off at its very best. Inside the restaurant it felt bright, airy and welcoming. There are lovely wooden floors and most walls are white-washed with some stripped back to their bare but beautiful, natural state. The chairs were incredibly comfortable, the ambient temperature was just right and there was mellow music playing in the background, so we felt relaxed as soon as we sat down. Even the staff seemed to glide around serenely. The floaty staff were also very friendly and helpful and demonstrably proud of the food they were serving. The dazzling sunshine from outside reached the interior of the restaurant via the large bay window at the front and a cleverly placed skylight at the back. It was all spotlessly clean and attractively decorated with fresh flowers. It is clearly a very popular restaurant and was very busy, but the tables are well-spaced so it did not feel crowded. Diners were dressed for a special occasion and regulars were offered their usual table. Clearly Limes is the sort of place that it is worth returning to time and time again. To drink, I had a glass of absolutely gorgeous, ice-cold, Pinot Grigio which tasted of fresh, green apples and Andrew went for a light, refreshing, chilled, American pale ale, just the ticket for a lunchtime tipple. While we enjoyed our drinks we were brought some bread and butter. The bread was described as sweet spice and star anise bread. It initially thoroughly confounded my taste buds, which were expecting something largely savoury but got, instead, something that was somewhere between bread and cake. However, once my palate had become accustomed to the unfamiliar flavours it became incredibly moreish. It was exquisitely fresh, beautifully soft, with a lovely golden crust. It was fragrant and unusual and utterly delightful. 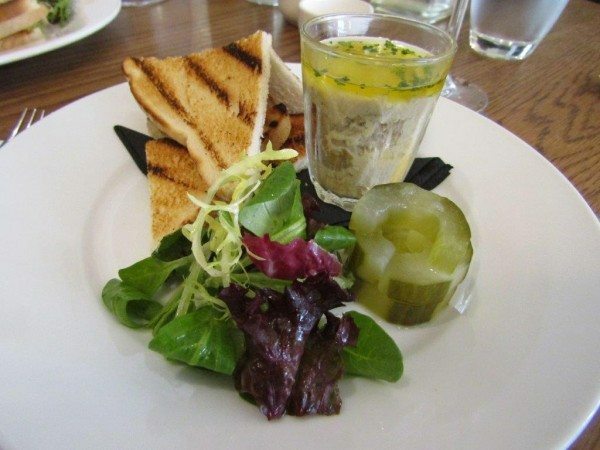 For starters Andrew ordered the pork and game terrine with apple chutney and I went for the potted mackerel, pickled cucumber and toast. 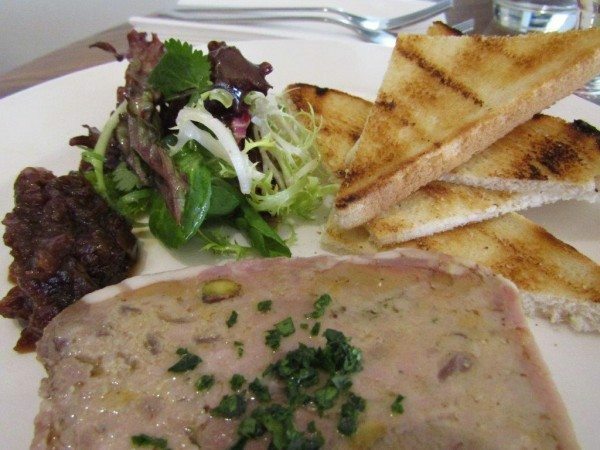 Andrew was delivered a good hefty slice of the pork and game terrine. It had a fantastic coarse texture with chunks of meat and large pieces of pistachio. It was meaty, savoury, earthy and perfectly complemented by the sweet, tangy apple chutney. Absolutely lush! The potted mackerel was smoky, rich, creamy and tangy and offset very well by the great chunky, slices of juicy, vinegary, cucumber pickle. All of which tasted scrumptious, balanced precariously on the corner of a triangle of griddled toast. Both our dishes were accompanied by a handful of lightly-dressed, fresh, mixed salad leaves, which tasted lovely in their own right. For our mains Andrew chose the roast lamb and I opted for the roast pork. We both got generous amounts of thickly sliced meat. Andrew’s lamb was medium-rare, tender and succulent. My pork was also well cooked and had tender meat with a good quantity of fantastically brittle, salty crackling. Both came with delicious, crunchy, iron-rich cabbage, juicy, sweet carrots and parsnips, well-browned roast potatoes, which were crunchy on the outside and soft and fluffy in the middle and little slices of melt-in-the-mouth swede. It was all coated with a rich, glossy gravy and everything was very well-seasoned. 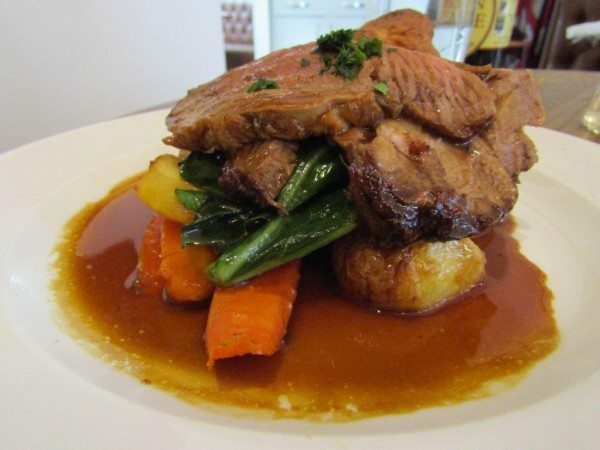 We were asked what sauces we would like to go with our meals and requested mint sauce for the lamb, apple sauce for the pork and horseradish sauce, because you just can’t beat it with a roast spud. The apple sauce was juicy, sweet and tangy and a perfect accompaniment to the pork, the horseradish sauce was creamy and fiery and the mint sauce was spliced with some sort of finely diced pickle (perhaps capers?) which gave it extra texture and depth of flavour. By this stage we were pleasantly replete but couldn’t resist trying the dessert that we had just enviously watched being delivered to another table. When we enquired, we were told it was meringue with damson and Chantilly cream. We definitely made the right choice! It was pretty as a picture and tasted even better. 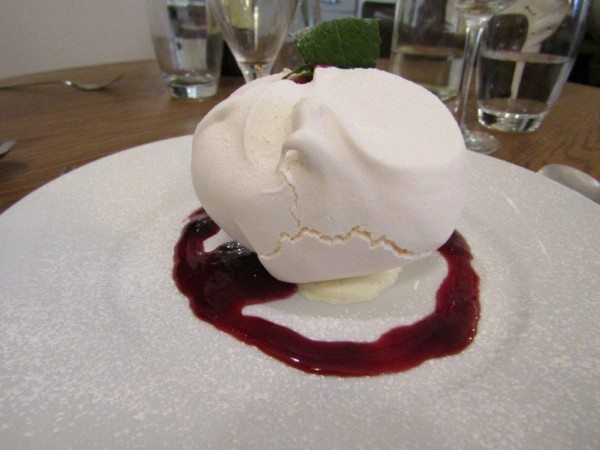 A huge, bright white meringue filled with thick, vanilla cream and a generous amount of glistening, deep burgundy, damson jam, my absolute favourite. All dusted with a good sprinkling of powdery, white, icing sugar. I am not normally a meringue fan but this was something else! The meringue was impossibly light and crisp on the outside and exploded in your mouth like a puff of sweet air. Then in the middle it was soft and marshmallowy and dissolved pleasurably on your tongue. The fabulous meringue was brilliantly complemented by the exquisite, zingy, sweet but sharp, damson jam and the smooth, vanilla-rich, Chantilly cream. Absolute heaven! Our entire meal occurred at a very pleasant pace and we left relaxed, full and very happy customers. Evenings are very popular so it is worth booking in advance to avoid disappointment. It is also open on Sunday for Sunday lunches and afternoon teas. 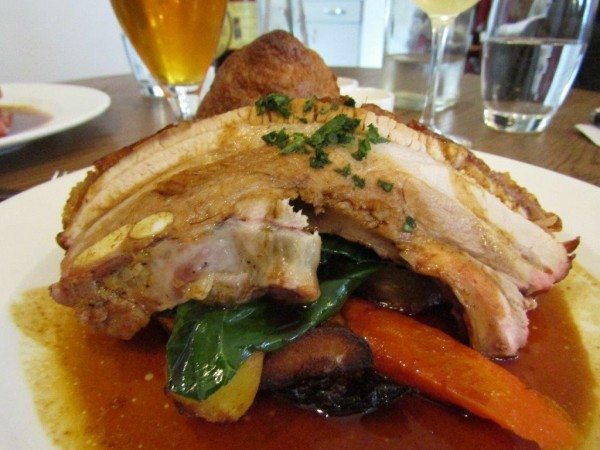 Sunday Lunch is available between 12:00 – 3:30 and will cost £20.95 for three courses or £17.45 for two.